Happy Day! I’m Athea Davis. A health and wellness educator, youth mentor, and yogi mom that totally gets that life stuff is tough stuff sometimes. We all need a little bit of “Awesomesauce!” as I like to say in our day to make our everyday (and every day) an Awesomeauce day! Nope, I’m not talking about perfection. I’m talking about the real deal thing called real life and getting the tools to create your own epic love story – in the rain, in the clouds, and the sunshine (and the hurricanes we can all find ourselves in spinning spasmodic loops of dearth and defeat at times). 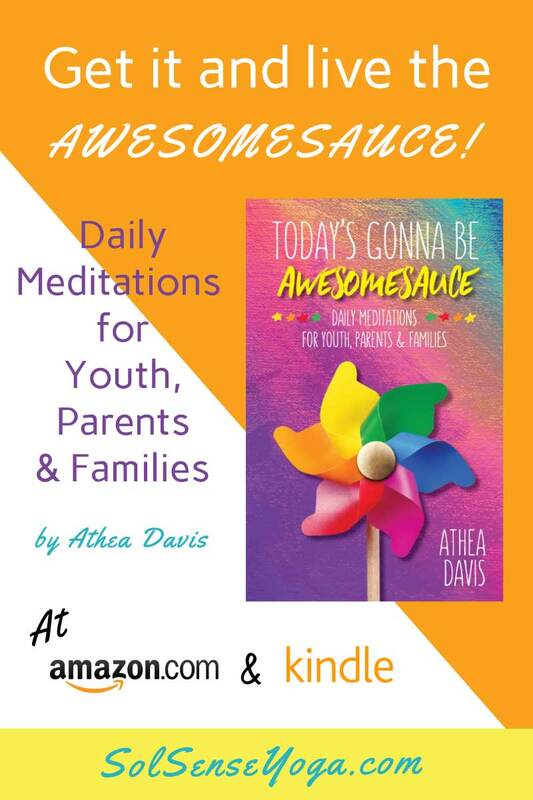 My book, Today’s Gonna Be Awesomesauce, will help you tune into your awesomesauce – that special sauce on the inside that helps us spread immense love on the outside. The book is filled with tips, tools, techniques and practical guidance you and the whole family can use. Don’t wait for it to happen. Create the possibility because #todaysgonnabeawesomsauce! Today’s Gonna Be Awesomesauce is a daily mindfulness meditation book for youth, parents, and families (and educators too!) filled with practical wisdom, quirky wit, and edgy savviness created with an educator’s lens, a yogi mom’s heart, and a superhero love for humanity. It’s also a book about turning grief (including our daily roadblocks) into rainbows. There are a lot of plans, strategies, checklists, and classes out there that help us try to cope with the stresses of life. Yet, if we don’t know how to practice focus and sustained concentration; identify and self-regulate our emotions; commit time to self-inquiry to gain better awareness about ourselves, how we relate to others and our environment; and learn tools that spark our creative power, then all those plans, strategies, and checklists are nothing more than what appears on the surface. My book takes readers below the surface to tap into a limitless reservoir of the special sauce, Awesomesauce, which feeds all that stuff on the outside to bring authentic transformation to how we relate in and to life. Also included in the book are 365 mindful breathing mantras. If you are short on time and can’t read the day’s entry, take note of the mindful breathing mantra. The book isn’t meant to be analyzed; it’s meant to be felt and practiced and, to be read with a contemplative lens. Let the words clear your mind and dance in your heart space. The book has something for everyone in the family and it’s great for educators too. Whether you read an entry a day or read a few, mindfully breath in the mindful breathing mantras in solitude, with your family, or your class, you will notice a shift in your heart and mind space. In that shift you will feel deep inside that Today’s Gonna Be Awesomesauce ! Use to augment classroom lesson plans in order to embed character development and key social and emotional learning competencie. "During my journey to achieve balance and equanimity in my life and share my practice with children, I have found numerous tools to help me at every step. 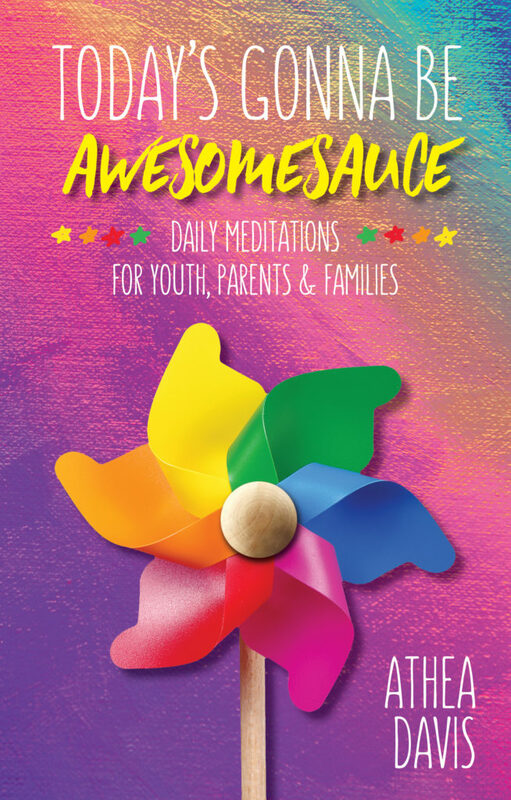 Today’s Gonna Be Awesomesauce is an absolute gem that I recommend for all families and educators, whether they are just beginning to dabble in mindfulness or have engaged in regular practice. Today’s Gonna Be Awesomesauce provides readers with empirical research on the benefits of mindfulness/meditation on the brain and teaches families and educators how to utilize movement, art, meditation, nutrition, music, and more, in daily life to cultivate deeper family and student connections that will, in turn, foster a healthier, happier world." 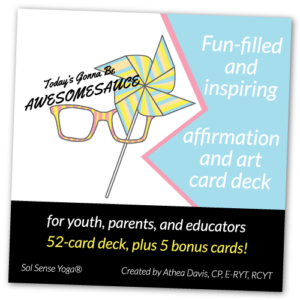 "Here in Today’s Gonna Be Awesomesauce, Athea stands with us, but also with our children as she cheers us on through daily milestones whether joyous or like bumps in the road. Moms, dads, and kids are all invited to participate and learn to increase responsibility and love as a family unit. Athea presents tangible activities such as breathing techniques, and she also offers general guidance, all with grace, a sense of humor and contagious joy. She teaches us to get “jiggy” and shake off negativity, and how to weave essential qualities into our daily lives such as playfulness, spontaneity, presence, collaboration, reflection, responsiveness, proactivity, honesty, compassion, and, one that really struck me, authentic reality." "I love this book! For kids and parents, it's a daily nudge toward positive communication and openness. Make it a family practice and it will become second nature. Together we can heal ourselves, our families, and our world." Download your FREE copy of my health and wellness guide: Awesomesauce Insights. My story in conceiving and writing my first book, Today’s Gonna Be Awesomesauce: Daily Meditations for Youth, Parents, and Families began over two years ago when my life, as I then knew it, completely changed from the inside out. I had to dig deep inside for something beyond myself that gave me vision and purpose. The words you will find in Today’s Gonna Be Awesomesauce infused my life with the breath of new meaning and I trust they will infuse your life with new meaning, too. My former spouse and father to my son unexpectedly died in a tragic accident in the spring of 2015. My son was 9 years old at the time (he is now 11). There are seemingly no words that can describe the tailspin of unfathomable pain that this event ignited in my life. But, paradoxically, it was through words – both written and spoken – that healed a deeply seeded wound in my body, mind, and spirit. So, I tuned into my own Awesomesauce and spread it in the pages of my book. As an educator, youth mentor for youth in the juvenile justice system, and mom I use all the tools and techniques that I write about in this book. I live and breathe the Awesomesauce every day and I’ve experienced and see the transformative impact that they’ve had in my life, my son’s life, my students’ lives, and the lives of our youth serving time in our state’s prison system. Athea Davis, CP, E-RYT, RCYT, is a health and wellness educator, youth mentor, and owner of Sol Sense Yoga. She writes, lectures, and consults youth, families, educators, and businesses on topics such as mindfulness, meditation, health and wellness, classroom management, family/conscious parenting, and a variety of social and emotional learning topics. Athea has a multi-faceted background of corporate and public law experience with health and wellness education. She brings an innovative and unique approach to the education/health and wellness sectors. She is committed to increasing social and emotional performance for youth, parents, and educators. In her spare time, Athea takes adventures of all kinds, relishing her most favorite adventures with her son. Together they love to create and spread the awesomesauce in each breath, step, and light and love dab along the way.